With a background in the mortgage industry, Jacqueline Ienni provides her clients with an incomparable approach to real estate – founded on lending expertise, vital resources and a vast network that enables her to provide the highest level of quality and service to each and every client. Jacqueline offers an extensive background in the real estate industry, one that is backed by over two decades of experience in the residential, commercial and private mortgage lending sector. Ranking in the top five at her previous company, Jacqueline’s achievements in lending and real estate are a testament to her persistent and successful nature that delivers results. 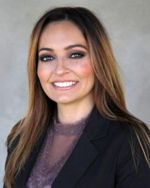 Now, as a member of The Louie Ortiz Group comprised of some of Southern California’s leading real estate experts – her clients benefit by having a team of dedicated professionals working alongside each other towards their goals. Being on this team further enhances her impeccable abilities to provide crucial market advice and service of the highest caliber. Jacqueline also distinguishes herself as an expert in the industry through her extensive experience and customer service orientation – one that is founded on a keen eye for detail as well as effective and creative business skills. Jacqueline excels in negotiating successful transactions for her clients with the utmost integrity and drive – her clients always come first.